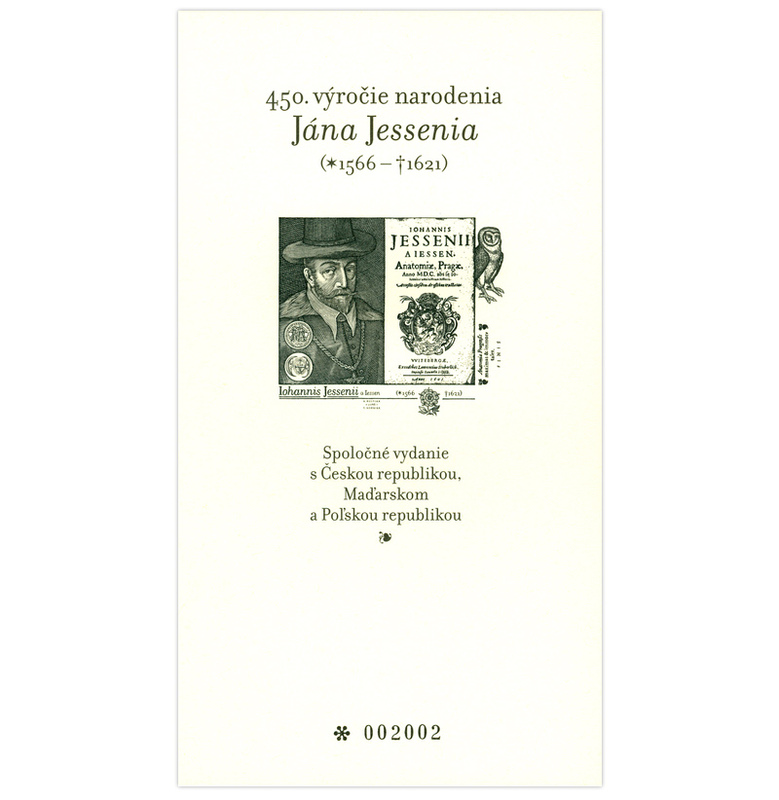 COLLECTORZPEDIA: Slovakia 2016 - 450th Anniversary of the Birth of Jan Jessenius (1566 – 1621). Joint issue with Czech Republic, Hungary and Poland. 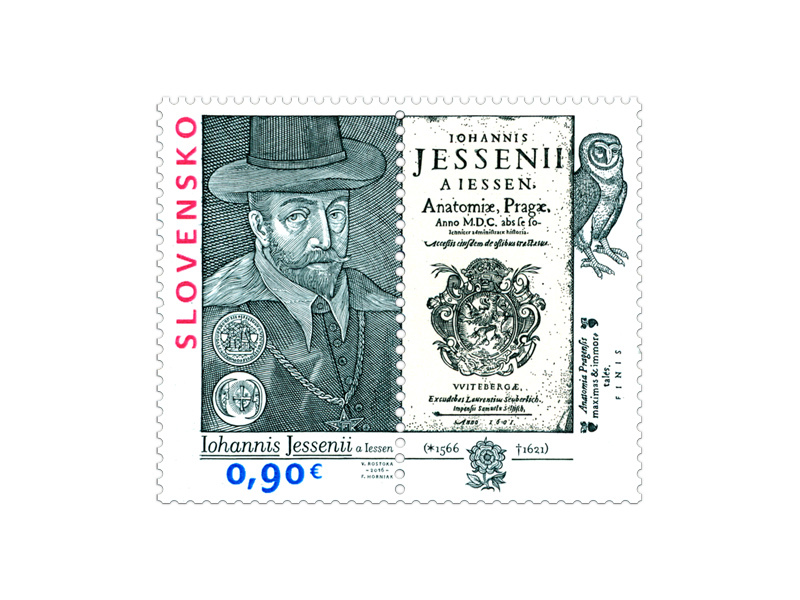 Slovakia 2016 - 450th Anniversary of the Birth of Jan Jessenius (1566 – 1621). Joint issue with Czech Republic, Hungary and Poland. The father of Jan Jesenius came from a noble family that originated in Turčianske Jaseno but lived in Wroclaw from 1541. Here he had a son, Ján in 1566. Ján graduated from grammar school in his hometown and then studied philosophy and medicine at Wittenberg, Leipzig and Padua. He received a Doctorate in Medicine in 1591 for his work De Putrescentis Bilis in Febre Tertiana Exquisita Intermittente Loco (On the Locus of Putrifying Bile in Acquired Malaria Tertiana). At the same time he earned a Doctorate in Philosophy for his treatise Provindiciis contra tyrannos (For the Defence against Tyrants). His medical career started in Wroclaw, but he soon became the personal physician of the Saxon Elector in Dresden and a professor of surgery and anatomy at Wittenberg. With such a strong academic personality he was elected Dean of the Faculty of Medicine and later Rector of the University. 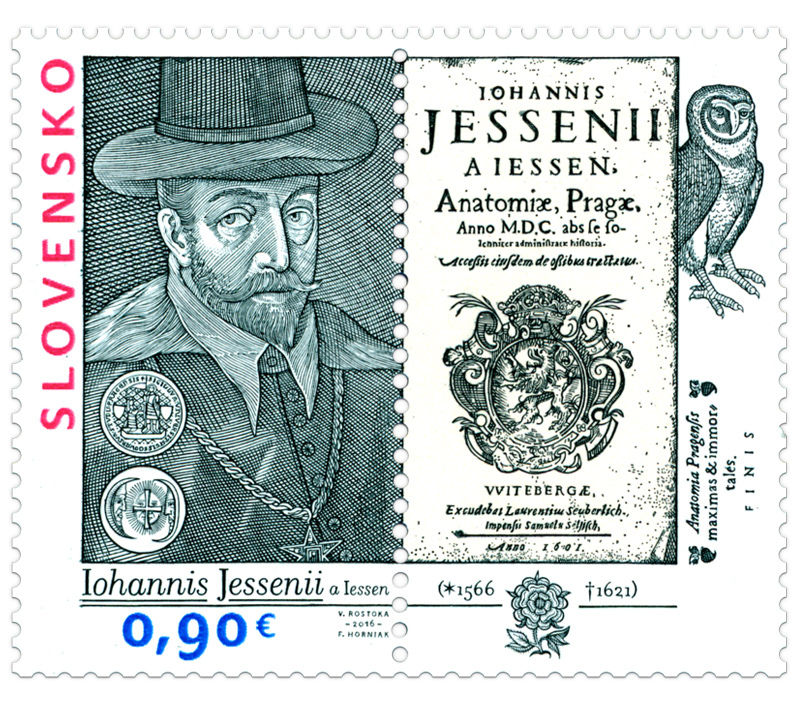 The most famous achievement of Jan Jesenius was the first public autopsy, which he performed in Prague in June 1600. From 1601 he lived in Prague, where he taught and acted as the personal physician of Emperor Rudolph II. 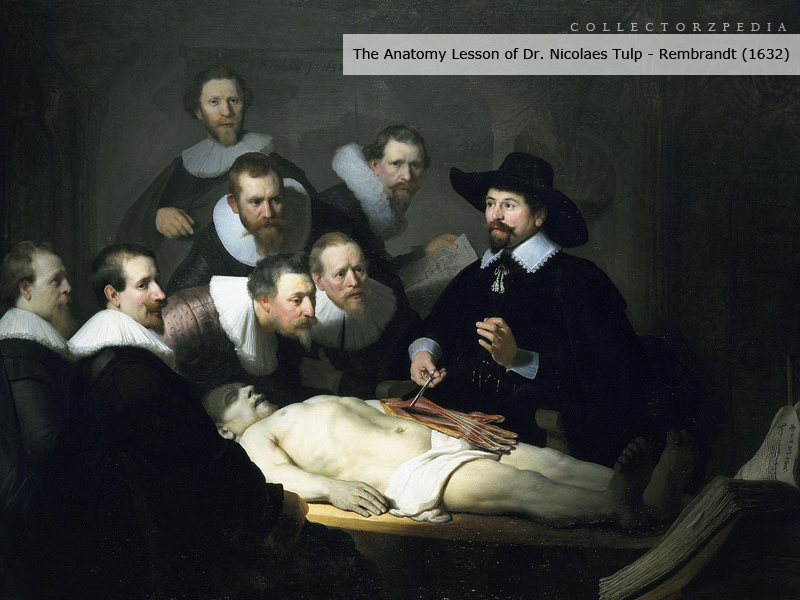 At that time his lectures on anatomy were very progressive. He was also interested in the political situation and as a Lutheran was strongly committed to the defence of the Evangelical faith. He was elected Rector of the University of Prague and became one of the leaders of the anti-Habsburg movement of the Bohemian estates. In 1618 he travelled to Hungary as a diplomat, where he tried to influence the Hungarian estates to not vote for King Ferdinand of Habsburg. He was arrested and imprisoned. The uprising of the Bohemian estates was suppressed at the Battle of White Mountain in 1621 which was followed by cruel reprisals. Jesenius was accused of rebellion and insulting the crown and was sentenced to death. His execution was particularly brutal: the executioner cut out his tongue, then he was beheaded and his body quartered. His head along with those of 11 Czech lords was displayed as a warning on the terrace of Old Town Tower in Prague for over 10 years. The postage stamp is an engraving of the period copperplate portrait of Jan Jesenius by the Nuremberg engraver Lucas Kylian in 1618. The coupon takes the form of the title page of his book “Anatomy” which contains a description of the Prague autopsy, published in 1601 in Wittenberg. 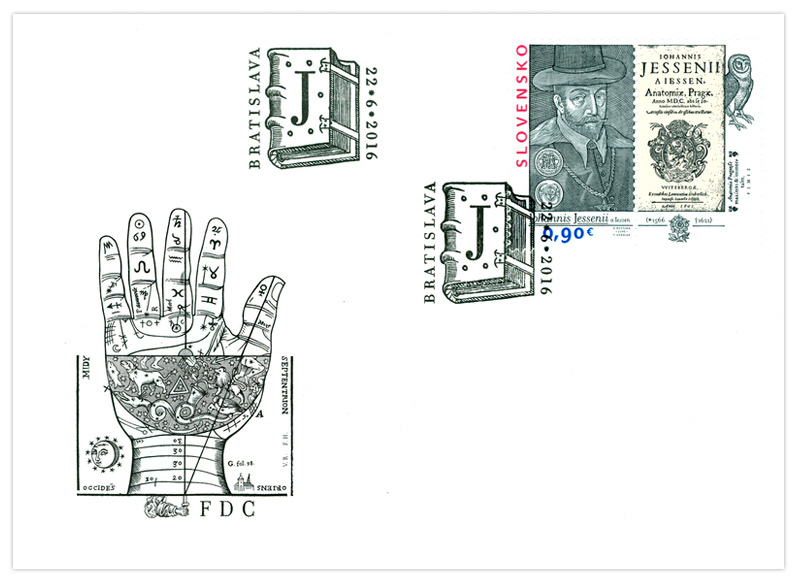 The style of the First Day Cover envelopes are based on woodcuts from the early 17th century, the imprint is a section of the hand including the astrological symbolism of human anatomy and the postmark forms a contemporary book binding. 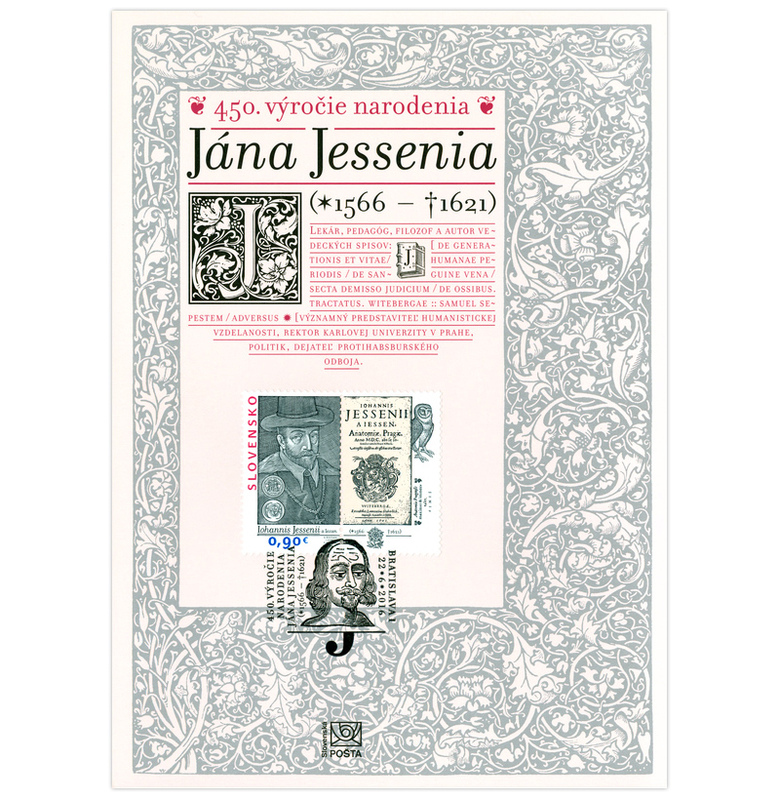 The issue commemorative sheet is decorated with floral ornaments from the 16th century and the motif of the occasional postmark is a wood carving portrait of Jan Jesenius from the chronicles that describe the execution of 27 Bohemian lords on the Old Town Square in Prague in 1621.